24. John SCHMIDT was born on 7 Oct 1820 in Germany. He died on 10 Jul 1891 in , McHenry, Illinois. 25. Fredarika BUHRMANN was born on 8 Sep 1818 in Germany. She died on 13 Apr 1899 in McHenry, Illinois. The families of Wm. Jesse, Charles Schroeder, C.B.Smith, and Mr. and Mrs. Wm. Radke attended the funeral of Mrs. Smith, mother of Chas. B. Smith, last Saturday. She was buried on 15 Apr 1899 in Cary, McHenry, Illinois. Cary Cemetery. From Pommern, Germany. Mrs. Reka Smith, mother of John Smith, died last Thursday, aged 80 years, 5 months and 5 days. The funeral was held in the German church, Saturday. The body was laid to rest, in the Cary cemetery. i. Christian Carl (aka Charles B) SCHMIDT was born in 1846. The Plat Map of 1892 shows that Charles owned 80 acres to the east of his brother's farm on the north side of Crystal Lake Road, north of Cary, Illinois. S.R. Brown owned the 80 acres separating their properties. The land is somewhat rolling meadow with the western half now a wooded area. Best use of this land would have been for dairy cattle although this has not been documented. He died Feb 16, 1925. Christian Carl Schmidt died Monday Feb 16, at 5:30 o'clock at his home on Crystal Lake Avenue, from heart failure at the age of seventy-eight years, two months, twelve days. Mr. Schmidt was born Dec. 4, 1846, at Clevenow, Pommern. In 1866 he was united in marriage to Miss Friederika Holtz, at Grichow, Pommern and twelve children came to bless this happy union, six of the children dying early in life. He came to this country in 1872 and was engaged in farming near Crystal Lake, and since retiring in 1902 he has lived as a resident of this city, and as a member of the Immanuel Lutheran Church. Mr. Schmidt leaves besides his wife six children, namely, Christian Smith at Williams Bay, William Smith, Frank Smith, and Louis Smith of Crystal Lake, Mrs. Lizzie Waschow and Mrs. Anna Ehlert of Crystal Lake, fourteen grand children, eight great-grand children, one brother John Smith of Cary and one sister, Mrs. Robert Radke. A Man of sound business judgement and genial personality, Christian Smith had a wide circle of friends, all of whom, as well as the members of his family, will miss him in days to come. Funeral services were held Wednesday at 1:00 p.m. from the residence and at 1:30 from the Immanuel church. Rev. F. G. Kuehnert officiated at the services. Miss Flora Kuehnert rendered a beautiful vocal solo. Also in the same paper. Mr. & Mrs. Albert Buhrman and son George and Mrs. Wildhager attended the funeral of Chris Smith at Crystal Lake on Wednesday. Notes: His tombstone, and the 1900 census say he was born in 1845. Lizzie Waschow's correct spelling is Louise Washo, the wife of Frank Washo. iii. Sophia SCHMIDT was born on 4 Aug 1850 in Germany. She married Robert Henry Radke in 1867 in Pomerania, Prussia, Germany. She died on 28 Oct 1935 in Algonquin, McHenry, Illinois. Mrs. Sophia Radke, nee Smith, 85 years old, died at her home Monday afternoon, Oct. 28. She had been in ill health for the past ten years and an invalid for the last three years. 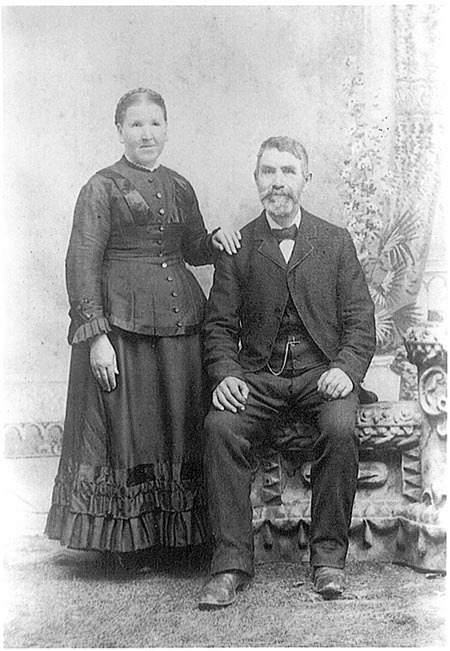 She was born in Germany Aug. 4, 1850, and when a young woman was married in that country to Robert Radke. In 1872 they came to this country settling in this vicinity. This union was blessed with nine children. Her husband, one daughter and two sons preceded her in death. Those surviving are: Mrs. Minnie Geister of Elgin; Mrs. John Knaack, Mrs. Joe Vlcek, Mrs. Fred Siegmeier, all of Crystal Lake; Henry Radke of Ridgefield; and John Radke of Kenosha, Wis. Also 24 grandchildren, 28 great-grandchildren and two great-great-grandchildren. Funeral services were held last Thursday at 1:30 o'clock from the late home and at 2 o'clock from St. Paul's Evangelical Church. The Rev. J. Thomas Haller of Carpentersville, Former pastor here officiated. Burial was in Union Cemetery.